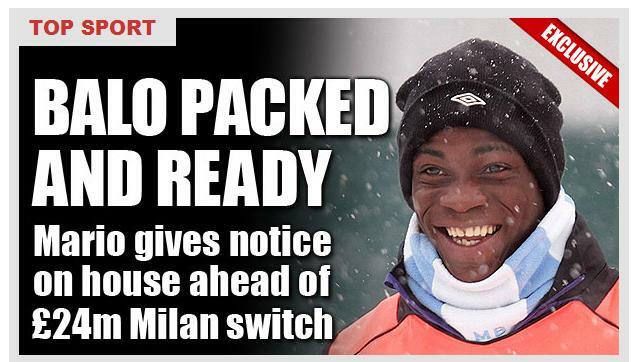 MANCHESTER - Oasis idol Mario Balotelli is all packed up and ready to join AC Milan in a £24million deal. The Manchester City striker, 22, has given notice on his rented house in Cheshire and has also begun flying his possessions back to Milan. His representative Mino Raiola was in Italy this week for talks over a move back to the San Siro. City boss Roberto Mancini is now happy to see the back of a player who has caused him nothing but trouble [to be honest he was man-of-the-match @ FA Cup final and it was decisive his assist for Aguero to win the league too, he was the hero of the historic 1-6 vs United scoring the first 2 goals, etc.]. since his £22m switch from Inter in 2010. Despite AC Milan owner Silvio Berlusconi recently calling him a ‘rotten apple’, the Italian giants still want him to spearhead their strikeforce (despite he can't play the Champions League vs Barcelona this year). Balotelli is also desperate for the move having grown disillusioned at City and homesick for Italy. He is a lifelong AC Milan fan, despite winning the Serie A title with Inter Milan under Mancini, and it would be a dream move for him. City will hold out for £24m but it now looks certain that his turbulent City career is almost over. Balotelli was recently involved in a furious training ground bust-up with boss Mancini.